2002 Yamaha Virago 250 – Les S.
• Today I went for my first ride in a few months. 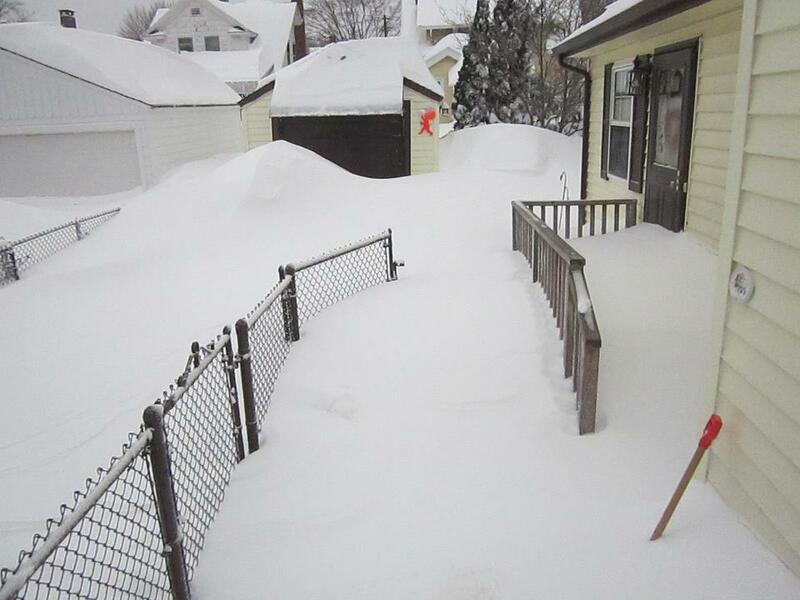 snow a few weeks ago – so I am really ready for spring. to remind myself not to bother to pull the plugs or touch the carb this year. I added a thermometer last year – a cool thing to have on a bike – and it read 56° or 57° on the ride. I have a carb heater indicator light and the carb heaters were “on” the whole time. The Virago 250 carb heater sensor functions like a simple on-off switch and is set to turn “ON”at about 52° F or 11.1 C and “OFF” at 58° F or 14.4°C. 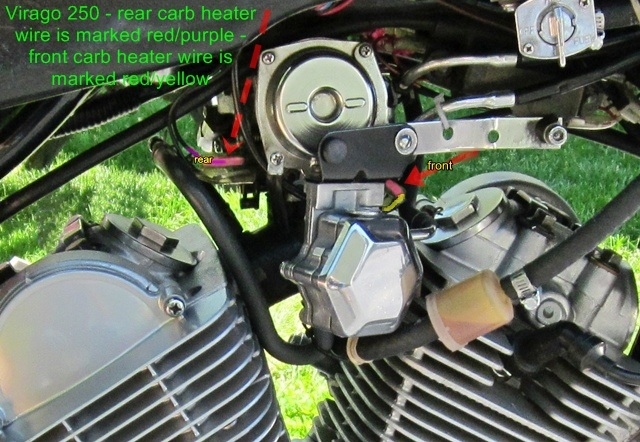 So at 52°F and below the carb heaters are “on” – and at 53° F (11.7°C) or higher they are “off”. My bike has two carb heaters – combined they use about 50 watts – my voltage meter drops from 13.3 volts to 12.8 volts when the carb heaters are “on”. • I just put on a smaller tire, but I do not think I could tell a difference on this first ride. 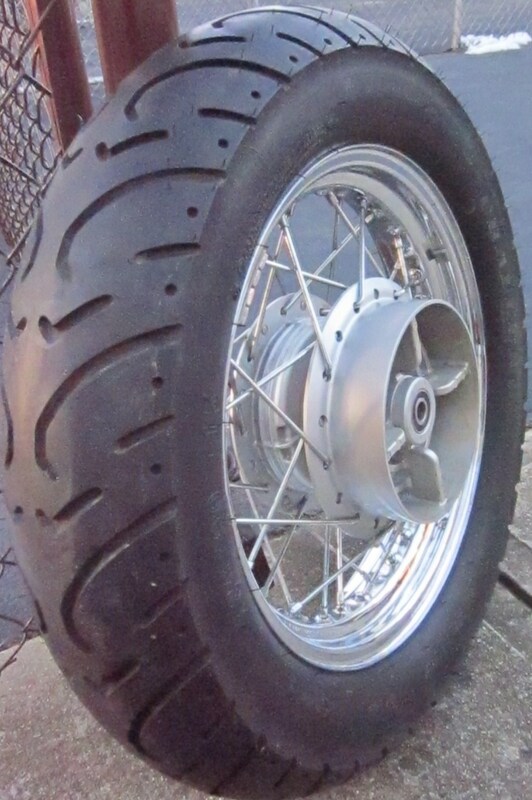 With the 130 tire, the bike should be faster due to the 4.5 lbs less weight, 3% lower gear ratio, plus the weight is rotating weight – which is the most beneficial weight-reduction thing you can do. It felt solid – I think some people are hyped by a larger tire (I was) and they believe that it gives a better, safer ride, but I am not sure – the 140 has maybe a 13mm [1/2 inch] wider footprint, but the load weight per inch would be lower, so you might not necessarily get a better, safer ride. This might not be a valid comparison, but sometimes when you go from a narrow tire to a wider tire, on muddy roads the wider tire actually makes things worse, because the skinnier tire gets more weight per inch. • The ride felt “just like old times” – maybe I felt “safe” because I drove it a lot of miles last year. Sometimes when I ride a bike for the first time after a long winter, it feels a little strange. • Before I got this bike, I wondered if the 250 would be too slow for me. The weird thing is, about 95% of the time, the Virago 250 never feels slow or underpowered to me. Maybe because of the good mid-range torque, or maybe because the engine is so responsive, or maybe because I subconsciously (unconsciously?) cut it a little slack for being only 250cc. I am almost never at full throttle, and it always seems like I am just an easy twist away from speeding. On my CB160 at age 16, I had it wide open all the time. I am a lot heavier now, so my Virago 250 is only about 10% faster than my CB160 was. • Big Bike vs. Little Bike – opinion. Here is my opinion on the big bike vs. little bike question. 1).. Little bikes are safer than big bikes in that they won’t do the really high top speeds, which is dangerous. 2).. Little bikes are more dangerous than big bikes when you compare the stability of most larger bikes. 4).. The low power of the Virago 250 is challenging, but not low enough to be frustrating – it does 0-60 in 10.5 to 11 seconds, so it is about as fast as the average car – so if you are driving aggressively, and the person in the car is not, you can usually out-accelerate them. 5).. The low power makes it more challenging to drive, but not more frustrating, and not more dangerous – 11 seconds 0-60 does not make a vehicle more dangerous, and 100 hp does not make a motorcycle safer. Some people use the “powerful bike is safer” as an excuse to get a big bike, but in my opinion, it is not a valid argument. I am guilty, too – and I have to use that excuse when/if I get a different bike in 3 ½ years …. 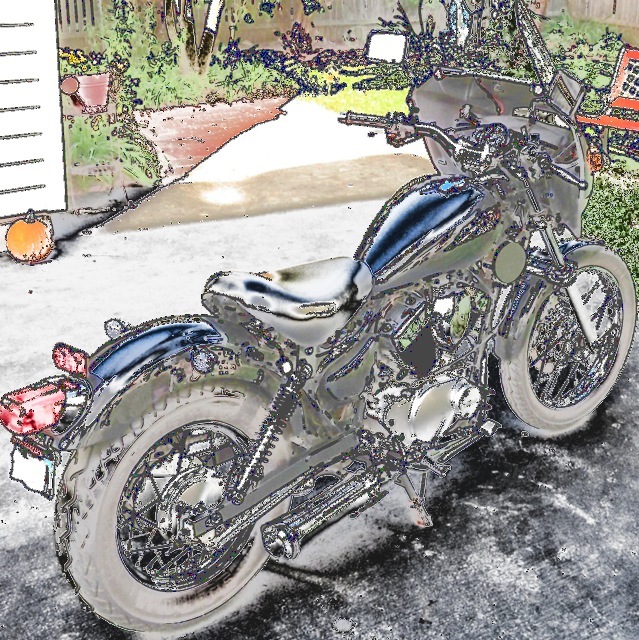 This entry was posted in Motorcycles and tagged First ride of 2013, First ride of the year, Kenda tire, Virago 250, Virago 250 carb heaters, Virago 250 fast enough ?. Bookmark the permalink. I have learned in my life that it more fun to drive a slower bike fast then a fast bike slow. There is no such thing as a bike that is to slow or underpowered, there are just different bikes with many different uses. Keep it upright.